Interior design trends keep changing and it’s important to renovate your kitchen to keep it from feeling dated and old. There are also many new appliances on the market, and kitchen renovations will allow you to make your kitchen space more efficient and keep the look of your home fresh and new. Kitchen renovations can include small changes such as the addition of a kitchen island, or some decorative millwork, or can be more extensive and make use of farmhouse kitchen design trends to add rustic charm to your home. 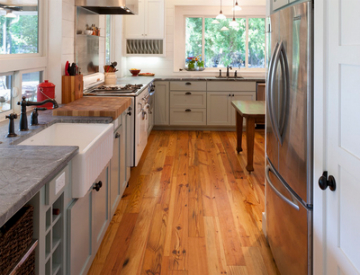 To achieve the rustic feel, many farmhouse kitchens use wooden flooring to add warmth and depth to the kitchen. You can use reclaimed wood to evoke that rustic feel. Open shelves mean that you have all your utensils and pots within easy reach and without having to dig through dark cupboards. You don’t have to replace your existing cabinets, just remove the doors. An apron-front sink is essential for the farmhouse look. With a deep bowl and sturdy construction, it’s both practical and ideal for heavy duty use. You can get modern stoves that evoke a rustic range feel, and these make a great addition to any rustic kitchen without compromising on cooking quality and ease-of-use. A large, accommodating kitchen table can be the focal point of a farmhouse kitchen design and can be used as an eating space or preparation space, depending on your current needs. Renovating a kitchen is not an easy job, and you want the professionals to do it. Contact us today to arrange a consultation at a time that suits you.